This pathetic tree shows the typical growth habit of an apple tree in a warm climate that has been left to itself; lots of tall, whippy branches emanating from the base of the tree, some of which may be root suckers. In fact, the main trunk may be indistinguishable from any suckers and pruning it back to a single trunk will be tricky. 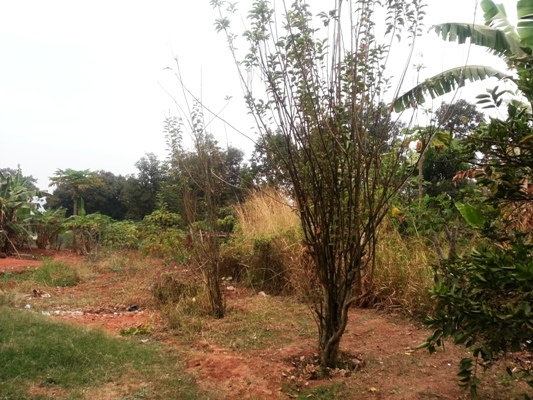 This type of growth is extremely unproductive, and the owner in Uganda reports that it bore a few apples a couple years after planting, but nothing after that. It is also unhealthy, prone to fungal diseases like powdery mildew and scab since the foliage does not dry out quickly. This demonstrates that you cannot just plant an apple tree in the tropics and leave it to itself to grow; it requires early and regular training and pruning to obtain a productive shape. If you’re not willing to do this training yourself or hire a knowledgeable person to do it, stick to mangos and avocados. The sad part is, if this tree had received proper training it would be loaded with a valuable crop right now. It is part of our mission at Kuffel Creek Apple Nursery to provide the knowledge and training for farmers to keep their apple orchards productive in rural tropic areas, which is just as important as providing the best planting materials.